Mystical queen. Its peak has been untouched for 14 years.… Twice as many climbers died trying to reach it than those who succeeded: Minya Konka 7 556 m (24 790 ft). 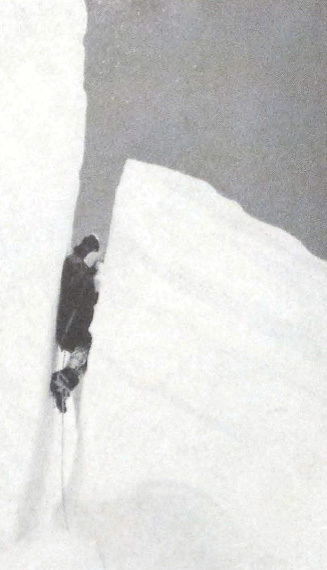 What’s the story of the bold first ascent made by four Americans in 1932? You are 25 kilometres as the crow flies from Everest. It’s still 5 000 vertical meters to the summit. That’s quite high, isn’t it? 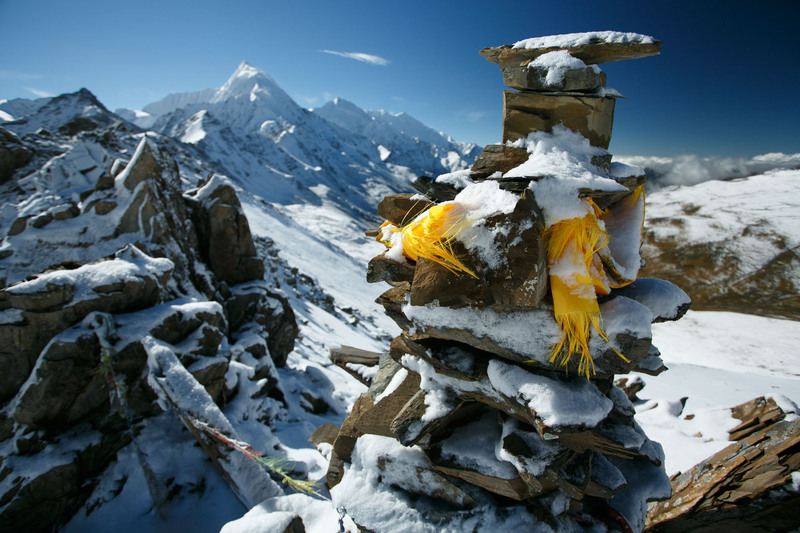 If you would go to China, 25 km from Minya Konka, the elevation to the top would raise to 6 500 meters. Plus, the last two thousands are objectively dangerous and no one would help you there. It’s even hard to see the queen of the clouds, let alone to climb her…. 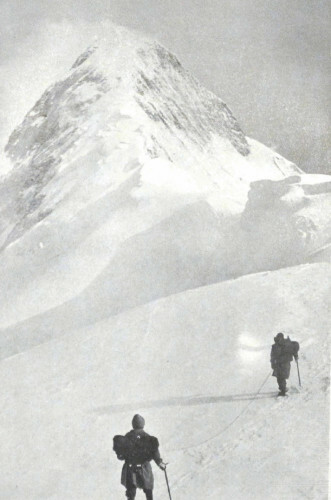 In the ‘30s people considered Minya Konka to be the highest mountain of the world. That’s why four academics from the USA set out in 1932 – to measure it, and to try to climb it. Arthur Emmons (a student of Harvard, a climber with experience from the Alps and the Dolomites author of the second part of the book). Jack Young (a student of journalism at New York University who spoke Mandarin). In 1935, they published a book titled “Men Against the Clouds”. Which stories do they offer to their readers? The story of the first couple, which went ahead starts at low altitude – they embarked on a motorboat from the port of Shanghai. It was a bit of surprise for them that that the boat was armoured on its sides. As they later found out, some of the unmannered Chinese people in the countryside enjoyed shooting at the passing boats. It a was fun and could bring a surprise from time to time. On their way against the current of the Yangtze river, Burdsall and Moore passed old wrecks and junky boats driven only by the manpower. Motorboat was a technological novelty. 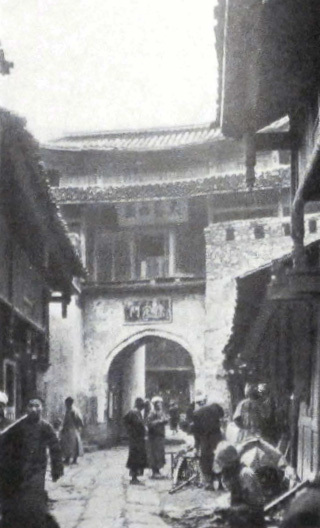 On their way to the mountains, the two Americans passed through Chongqing city: “I was surprised by seeing a few cars,” notes Burdsall. At that time, the population of the city was 600 000 people, today, it is one of the biggest cities in the world with population of 28 million. Times are changing. The adventure discussed in this article was not measured in days but in months. 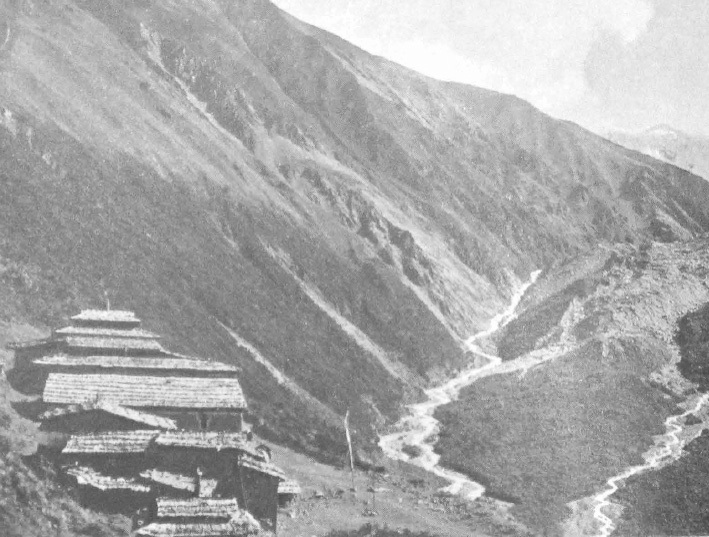 Burdsall and Moore sailed for 16 days (fortunately, they were not shot from the bank) and reached the Sichuan province, where Minya Konka is situated. Back then, in this region, the banknotes were not in use yet, therefore, they brought silver Mexican dollars with them to be able to change them for the goods they needed. Today, you can withdraw cash from a cash machine in any Chinese town, however, you could only wish that the prices would be the same as back then. Hiring a rickshaw for an entire day costed 4000 pieces of the currency used at that time in China – that corresponds to four American cents. Having a servant was a standard those days so they hired one during the sail. Burdsall and Moore got to a stuffy city Ya’an (named Yachow then) where they had to disembark and continue 225 km on foot to the “Tibetan Gateway” Kangding (named Tatsienlu at that time). 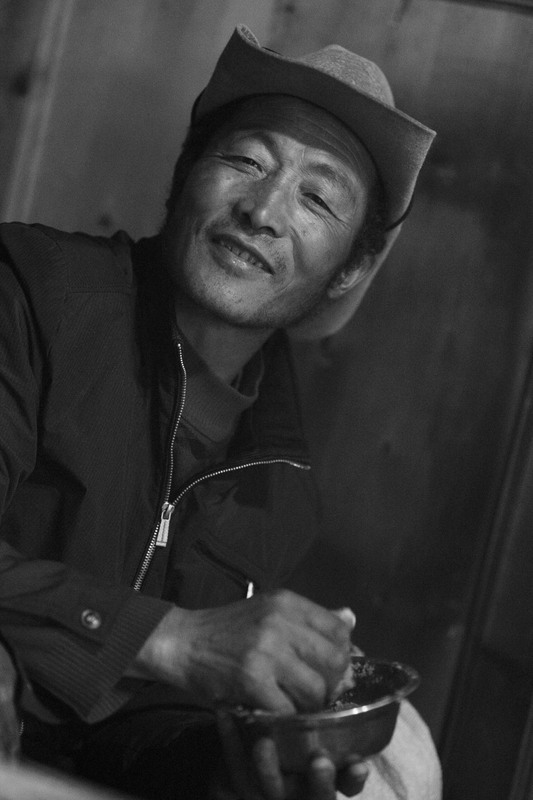 From the land of the best Chinese tea around Ya’an, the caravan set out for the peaks of Tibet. The Americans had to get 625 kilos of gear to the foot of the mountain. They hired 15 bearers, of which each carried over 40 kilos – that was considered to be a merciful load back then. 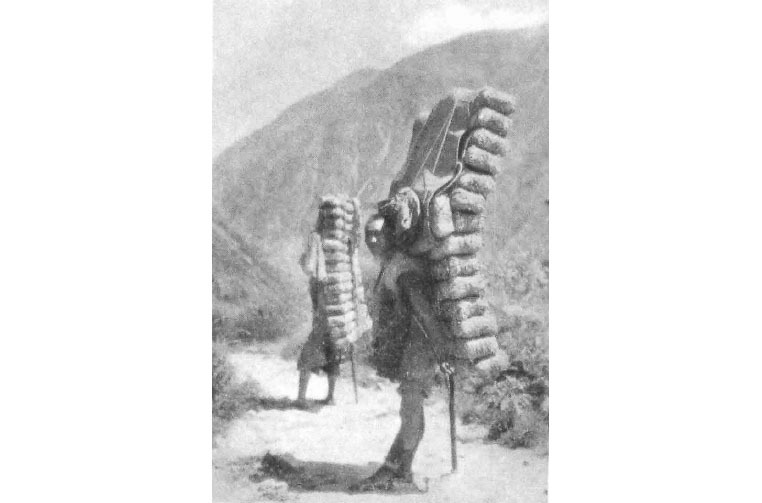 To earn enough money, local bearers were often carrying loads of compressed tea from Sechuan to Tibet as heavy as 160 kilos. 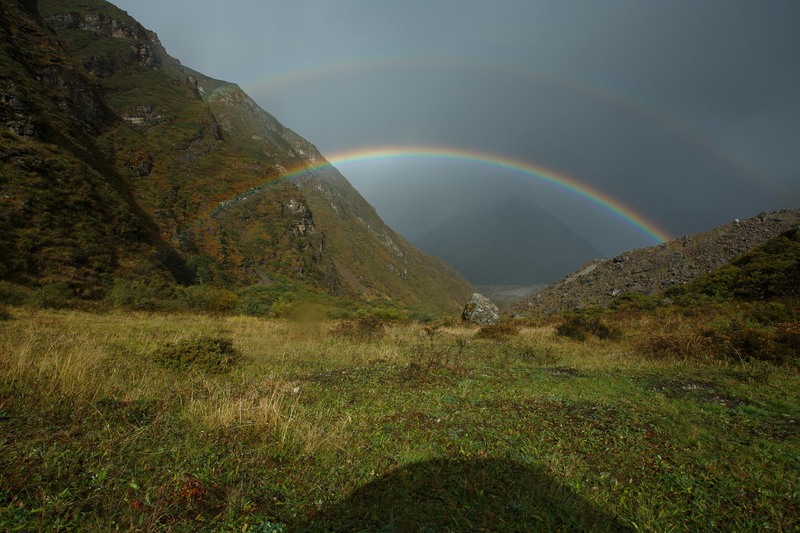 On their way to Kangding, they went through a strong storm that caused several landslides. They passed a damaged house with wounded people. “Are there still some dragons hiding underneath the ground?” asked the ragged villagers, who believed that white people have a special ability to see through the soil. (The first westerner – Joseph Rock explored this region as late as in 1929 and was the first foreigner to visit Konka temple). 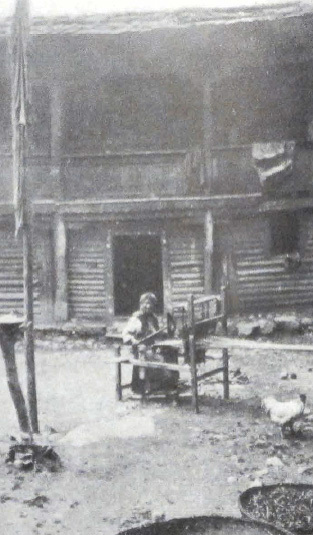 Even today, a foreigner is a focal point in the street. However, nowadays a smooth asphalt road leads to Kangding, beside it, concrete pillars are already waiting as a base for a planned freeway. In the city, you can see a plenty of high-rise buildings, cinemas, restaurants and luxurious jewel shops. There is even a SPAR supermarket and KFC. 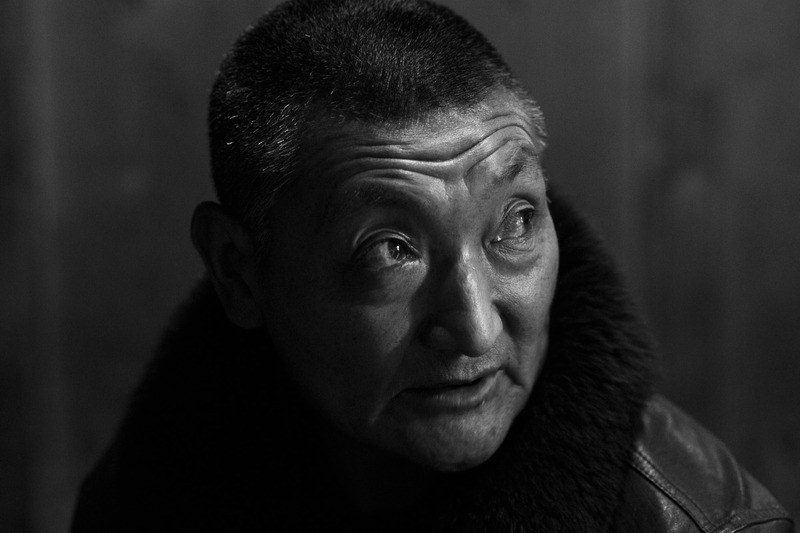 The Tibetan monks are looking for luxury as well – they circle around expensive restaurants asking for money. Where is the historic center today? It is simply gone. During the cultural revolution in the end of 60’s, the Chinese disposed of everything old. Maoist red guards got all the way to the Buddhist temple Minya Konka located high at the foot of the mountain and destroyed it completely. 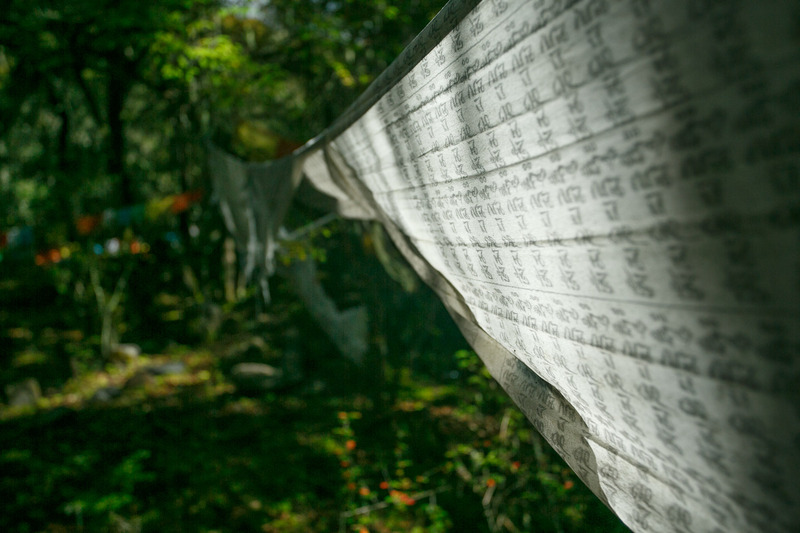 They burned collections of sacred texts and drove away the monks. Today, the monastery has been rebuilt, and is more or less functioning again. But let’s get back to our American couple in 1932. 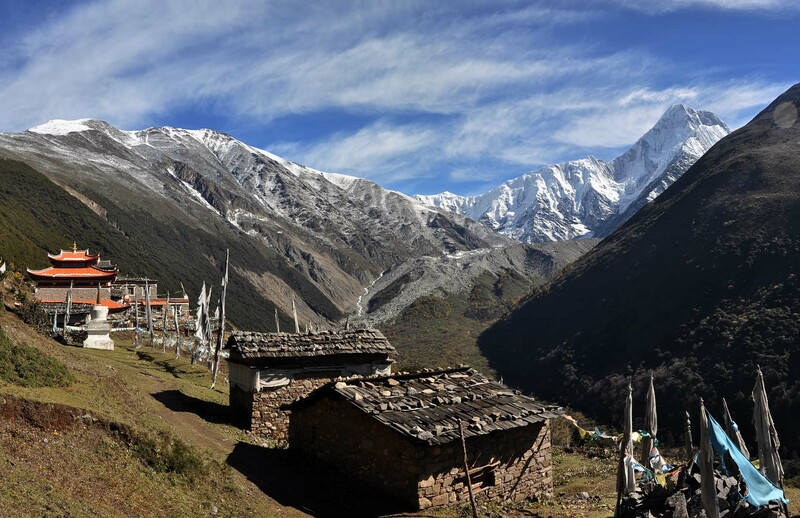 From Kangding, it is six more days on foot to to even see the mountain. 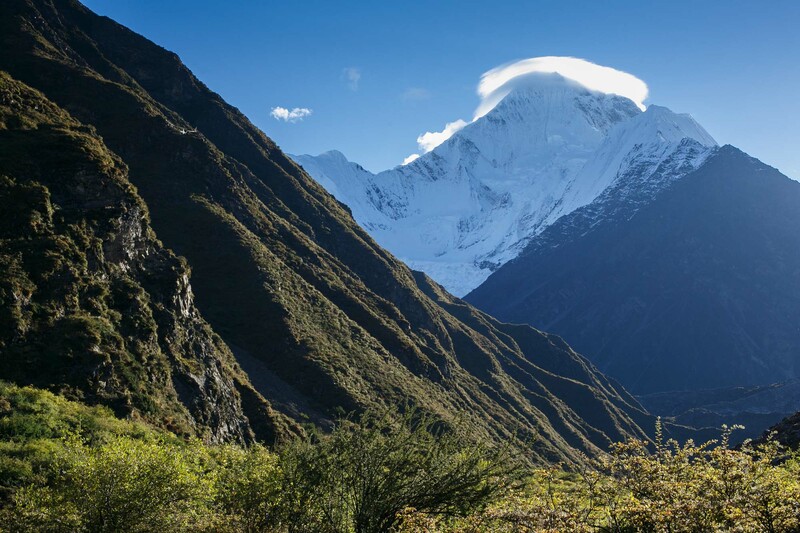 They reached the region of Khams – the Tibetan ethnic group famous for long-haired men excelling at horse riding and fighting. Americans were examining ruins of houses in one of the cols: “In the spring, the bandits caught thirteen people and chopped their heads of,” the guide informed them. In the ‘30s, Kham was a real wilderness. “Once they killed a missionary, stuffed his body with straw and hung him on the terrace of a temple as a warning,” remarked one Chinese historian. Andrew Varil working on his master’s thesis about Sichuan. “The mountains are high and the emperor far away,” was a local saying. 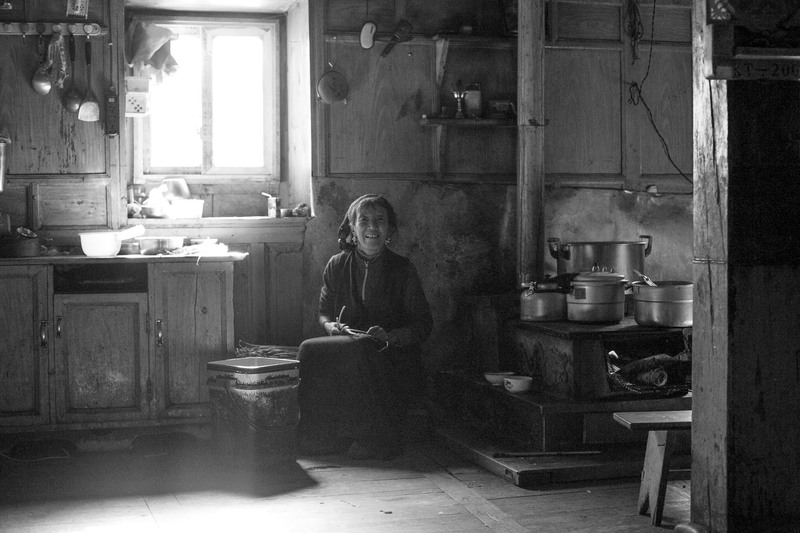 (In the ‘30s, it took around 15 days for an urgent message to travel from Beijing to Lhasa). 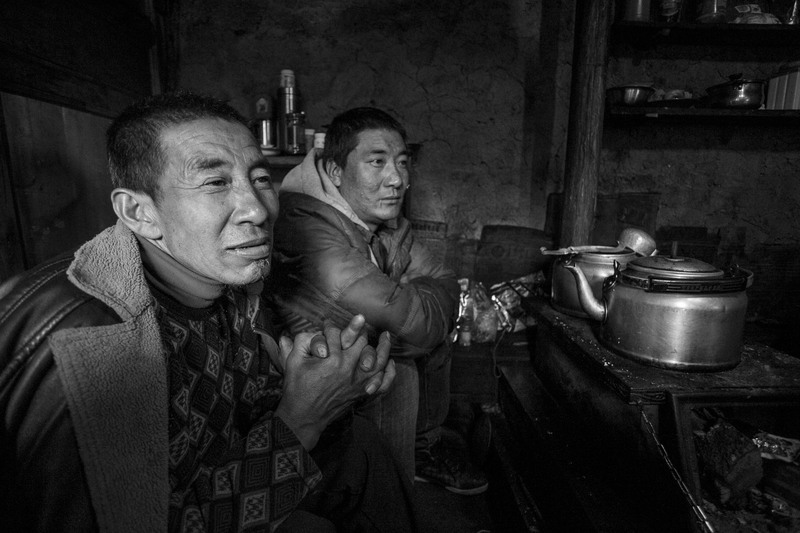 However, Burdsall and Moore considered local Tibetans to be a trustworthy people able to help in any situation. Together with them, they built “Camp Alpine” from which they first saw Minya Konka. “One of the wonder mountains of our planet. We are not surprised that it has called us from such a distance,” comments Burdsall on his first view of the valley. 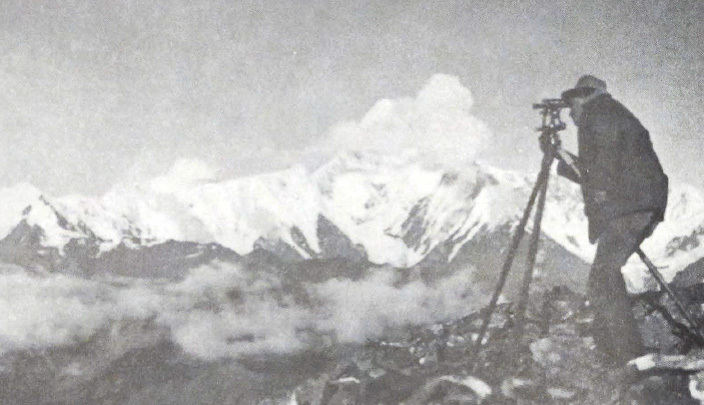 They were located on the opposite ridge and started to build a triangulation system there from the fragile theodolite which they almost shattered on their way. 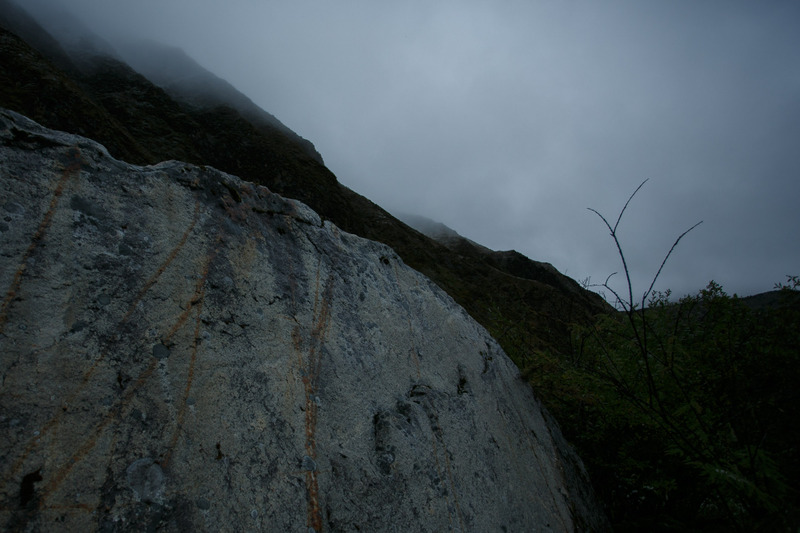 Often, it was impossible to see the mountains because of thick clouds and thus the process took them 25 days to complete. 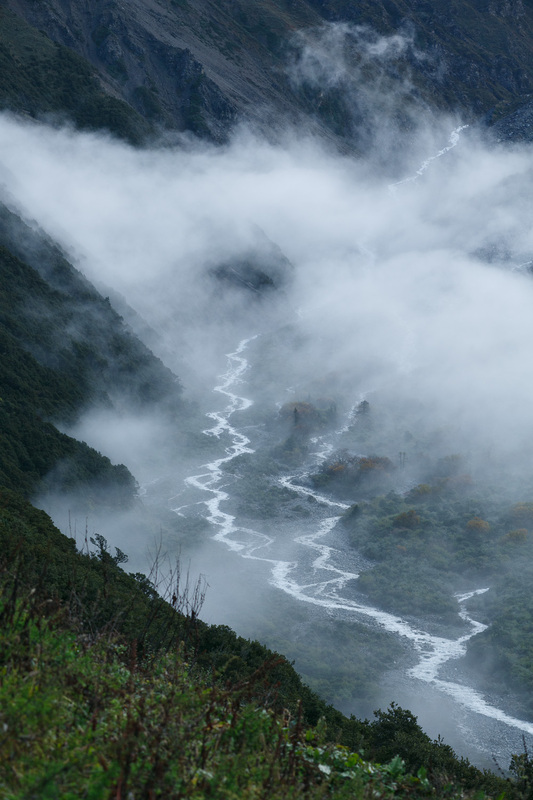 They also attempted to take a panorama picture of the whole main ridge – however, the typical local summer weather did not give them a single chance. 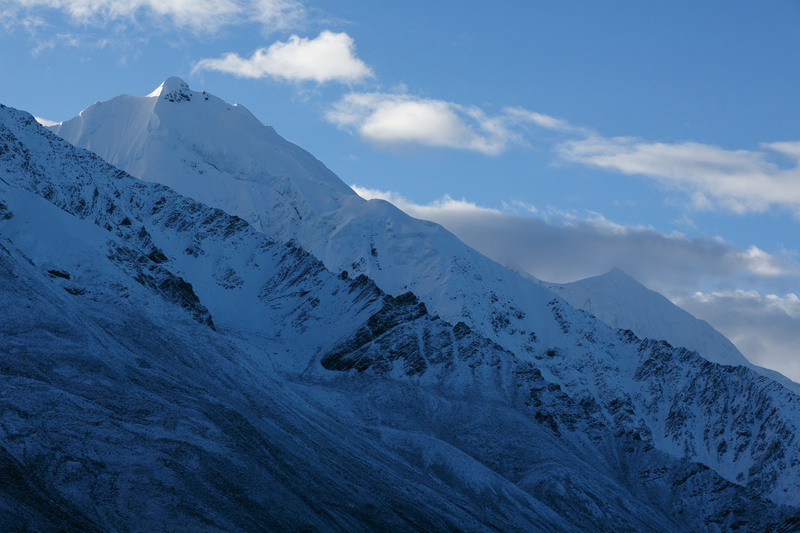 After they measured the mountain, they felt a bit disappointed – Konka turned out to be significantly lower than Everest! After they completed their equations, they got the result of 24 891 feet which is 7586 meters (today officially 7556). 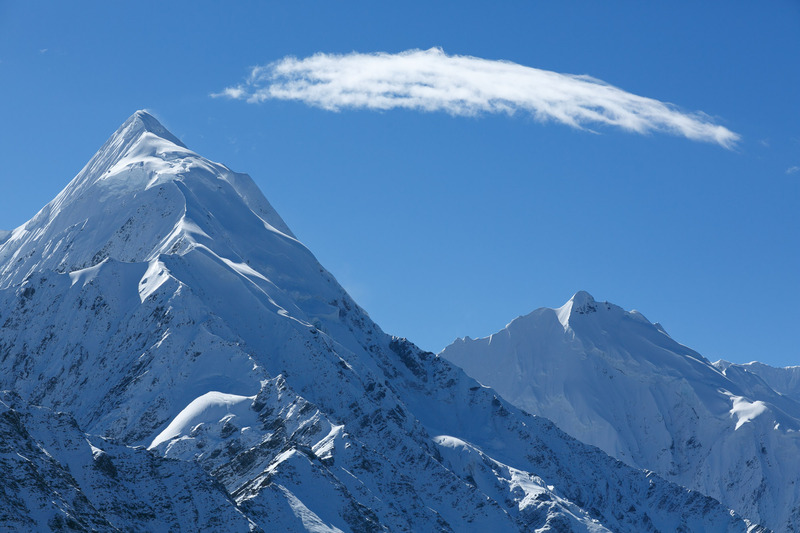 On the other hand, they realized that such a first ascent would be a record for American climbers and that it would be the second tallest mountain climbed until then. 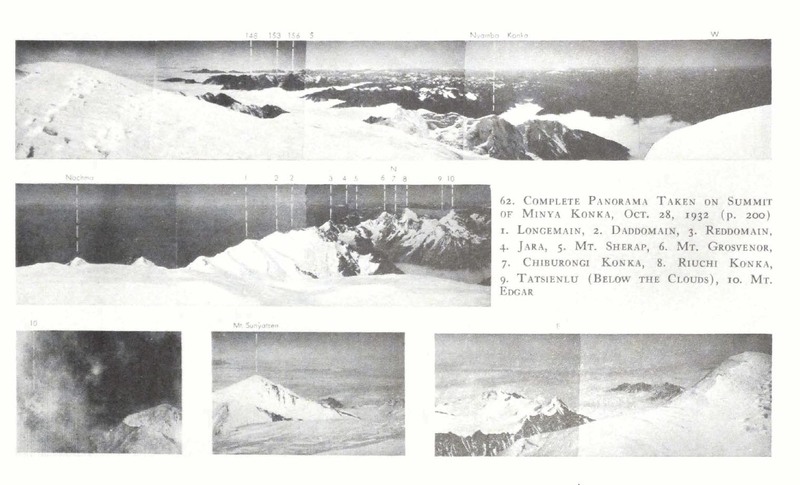 The 8-thousand-meter mountains were still sleeping back then and the highest point reached was an Indian mountain Kamet (7756 climbed in 1931 by a Briton Frank Smythe and his team). By the way, how many of today’s studied climbers would be able to measure their mountain using theodolite, sextant, paper and scissors? After more than three months of travelling, the team finally started exploring the mountain. From this point on, the book is narrated by Arthur Emmons: “To climb Konka, one has to approach it slyly,” he says in the foreword. 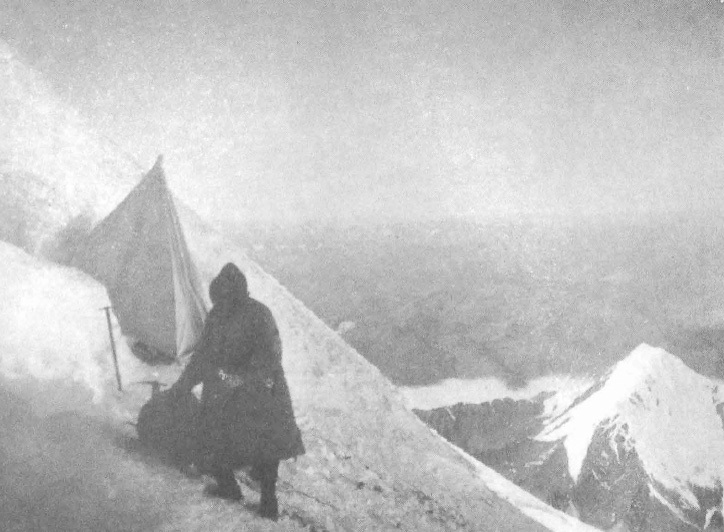 People saw the mountain as unclimbable but academics were always skeptical. Emmons arrives to a monastery, which faces the mountain and provides a perfect view of its west face. “The only option was a ridge that looked as the most unwelcoming one I have ever seen,” he describes the sharp white blade of north-west ridge. The other routes look impossible because of the avalanche slopes. 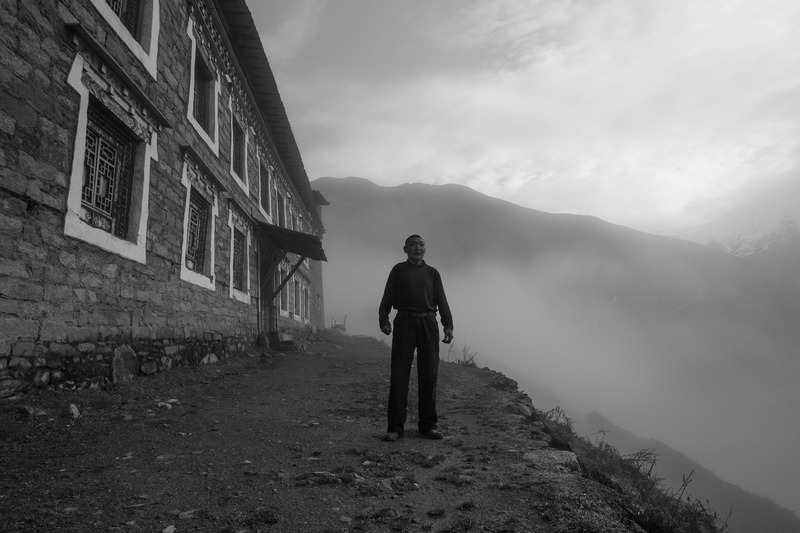 As an experienced climber, he knows that mountains are generally most easily accessible from the south so he descends from the monastery and circles the mountain from the southeast. However, 10 days of searching for an easier route did not reveal anything better. 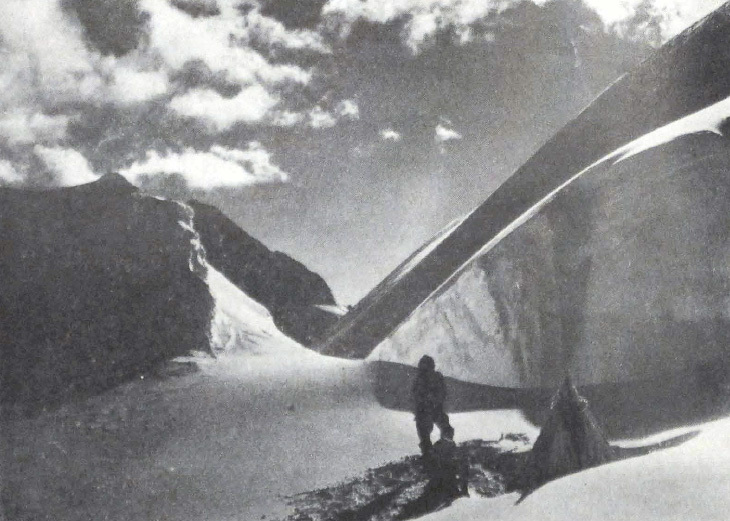 Emmons was stopped by a steep ice barrier which was moreover not connected to the eastern ridge. “How to solve this enigma?” he asks himself. 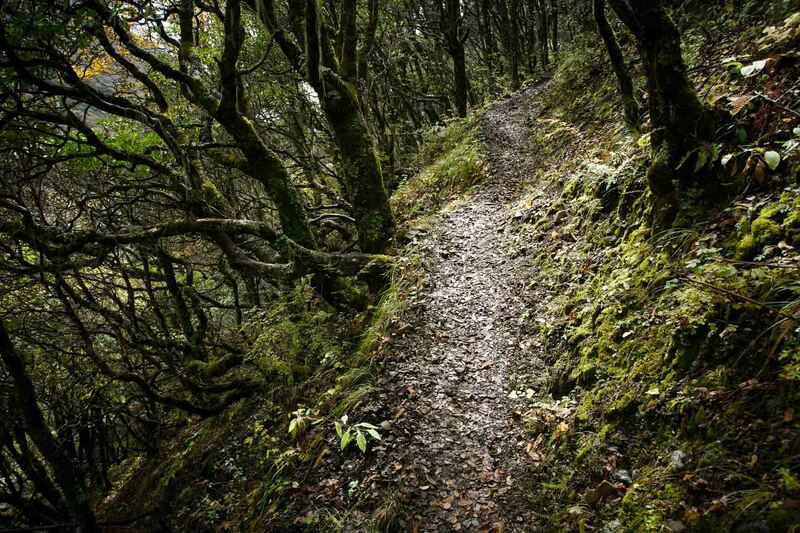 He sees their last hope in “the most unwelcoming” northwest ridge. On his way back to the valley he suddenly spots some people in the distance. Young and Moore together with a group of Tibetans join the group. 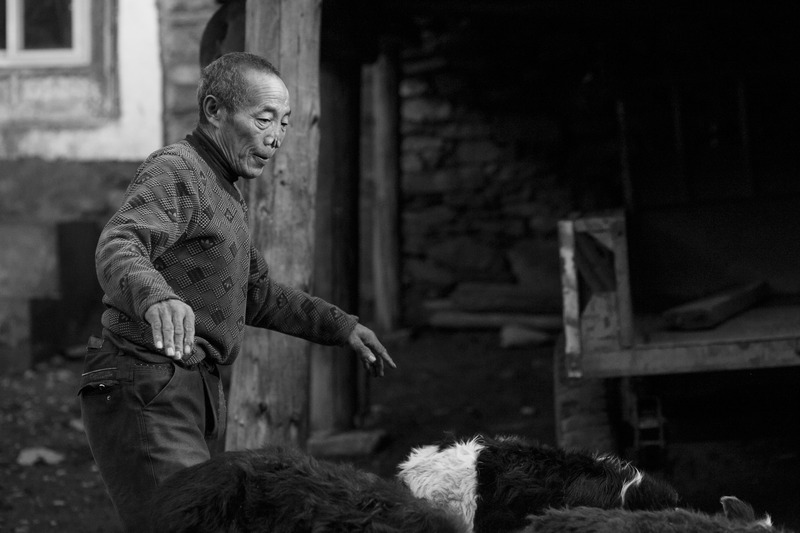 They tell him that few days ago, Chinese soldiers stole some of their horses. “We weren’t in the mood to let it be so we tracked them on horses. They weren’t answering our calls so Moore sent a few warning shots whistling above their heads. After that, they returned our horses quite quickly,” Young describes the story of their meeting. The team was finally complete. Together, they ascended to the monastery again where local monks offered them two rooms for storage. Americans brought a flashlight as a gift for the main lama. “Unfortunately, he’s not here, he has gone travelling,” you can give it to him later, explained one of the monks. The American team caused quite a commotion in the monastery when everybody found out that they wanted to climb to the place which Tibetans considered a “golden crown where the god of thunder rests.” Young explained in Chinese that they came from a great distance and that they have only the best intentions. The monks finally agreed and offered them team of bearers consisting of five men and a woman. While the others were resting in the monastery, Emmons set out to explore the sacred “Valley of Surprises” all the way to the foot of the mountain. He is the first white man to walk upstream from the monastery. Even today you won’t find a person up there. 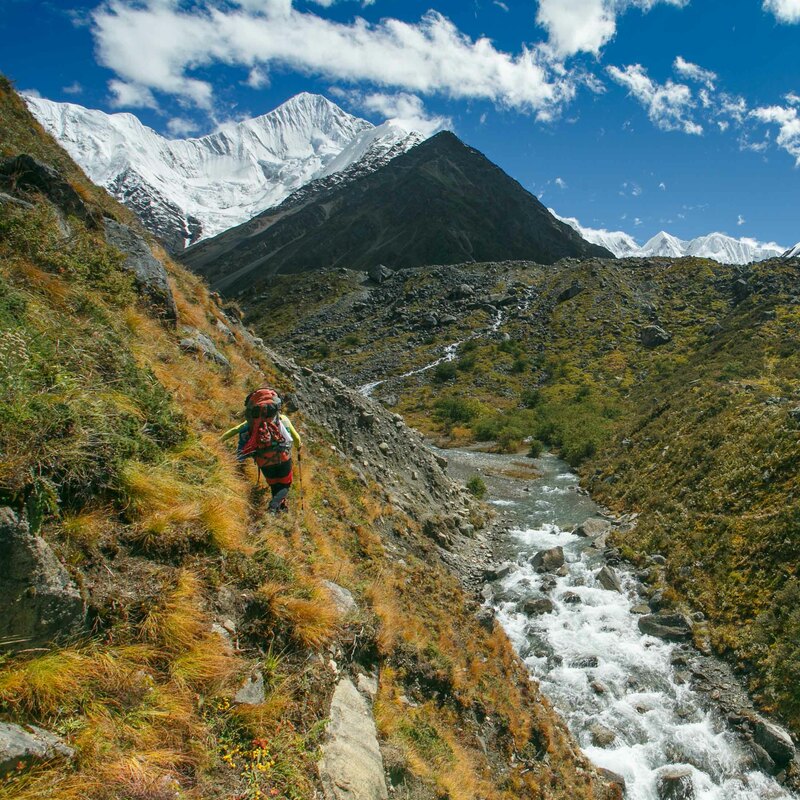 They headed up from the valley together – four rucksacks were carried by the Americans and six by the Tibetan bearers who then returned back to the monastery to bring another load. 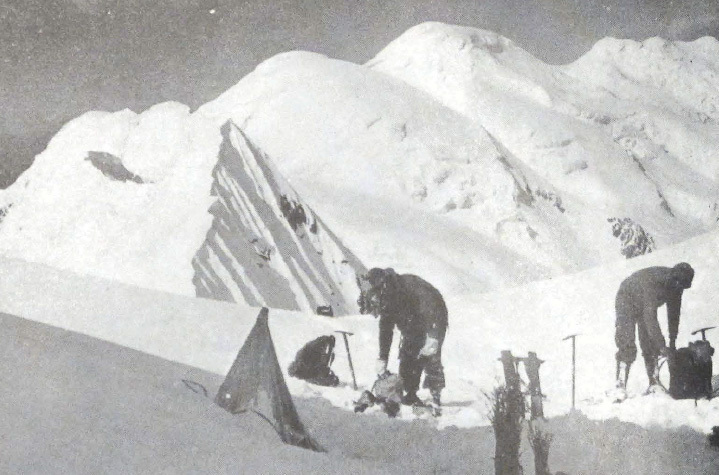 As the first mountaineers in this place, the team had to built a base camp. No Tibetans went above that point. 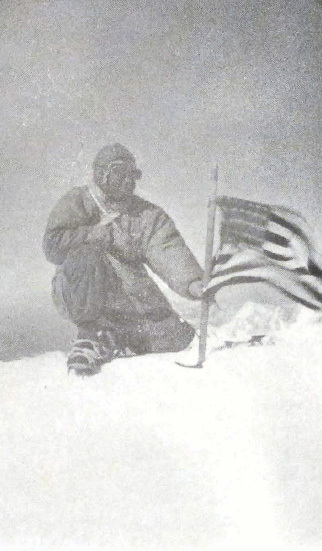 “We didn’t want to risk lives of the locals for our daring goal – spending a few minutes of glory on the icy summit,” describes Emmons, always the gentleman. He was the first one to ascend through the mixed sloped to the lower ridge (number II on the old photo below). 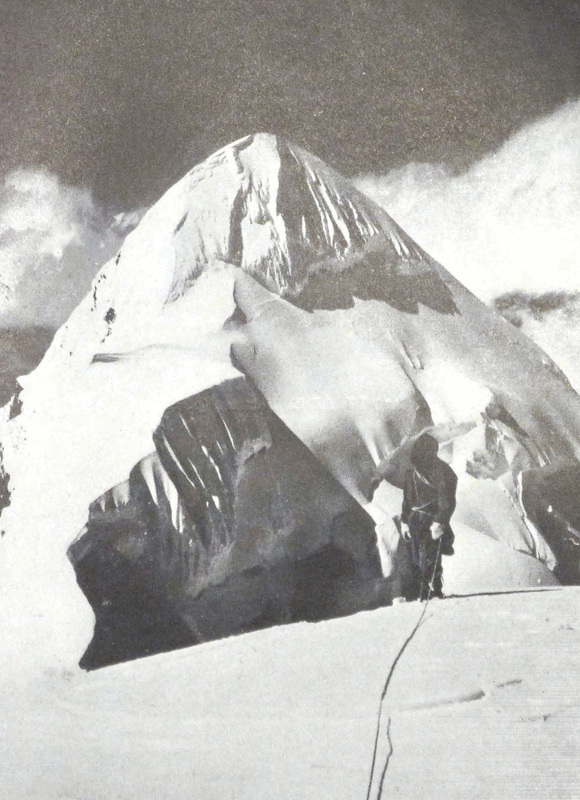 Together with Burdsall, they shoveled away the snowdrift on the top and built there a pyramid tent from heavy cloth and a single bamboo pole. The equipment they used would generally seem funny today. 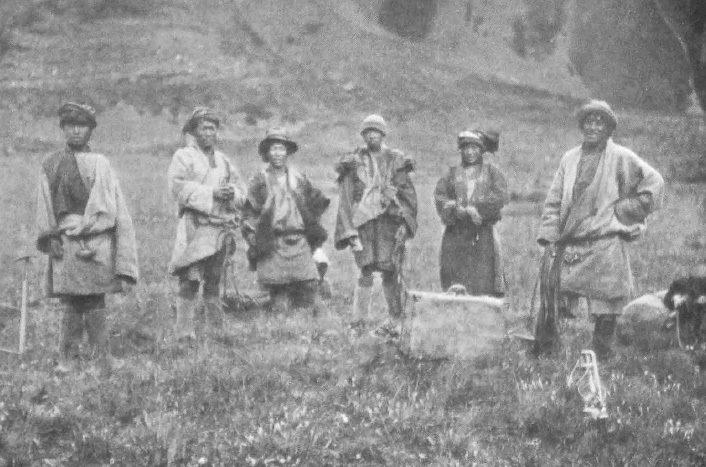 They were scaling the mountain wearing cotton, wool, and leather. The flannel t-shirts were essential. For cooking, they were using an old primus gas stove that wouldn’t burn gas above 7000 meters so they had to switch to kerosene. Soon they found out that two thin sleeping bags for two people work better than a single warm bag. 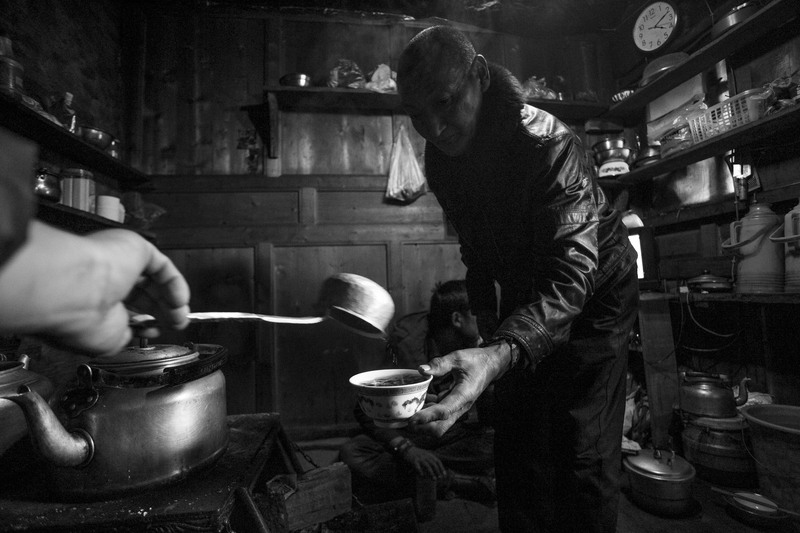 They used down sleeping bags, wore three pairs of gloves and mittens with dryable inner layers which they warmed during nights on their bodies together with socks. They also kept a rubber bottle with sherbet under their clothes and always carried an emergency flare. 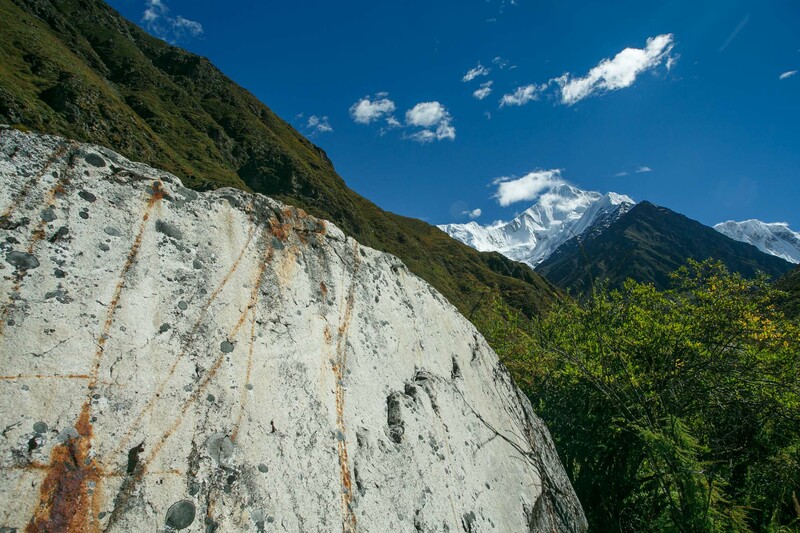 In rough terrain, they marked their trail with color stripes that they painted on stones every 100 meters. 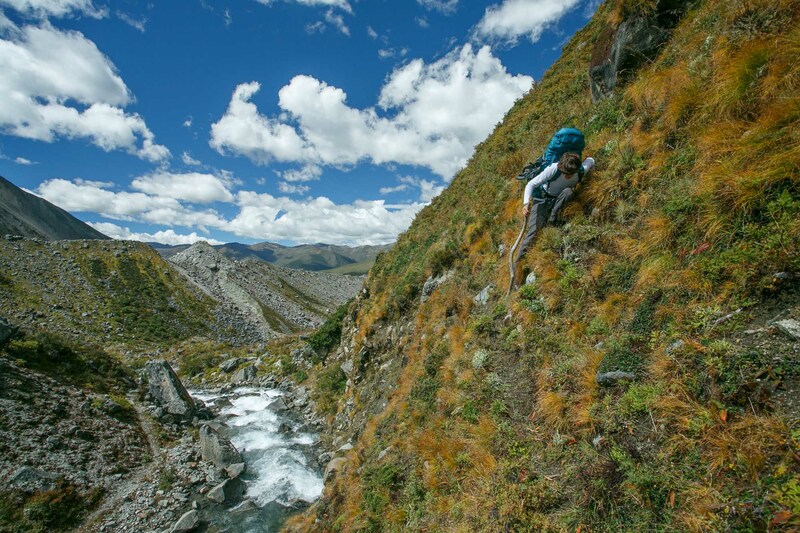 They used wooden ice axes, 10 point crampons and 15-meter hemp rope. 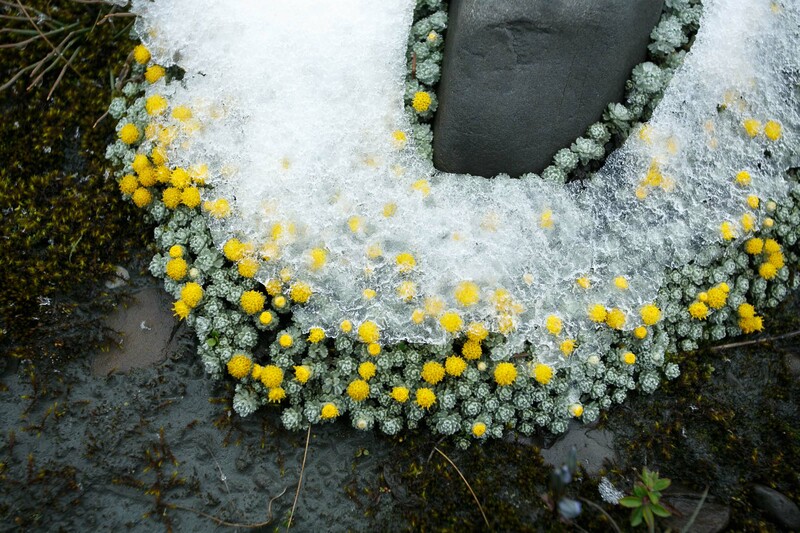 Despite all this, they climbed in the alpine style. The higher they went, the more they suffered. 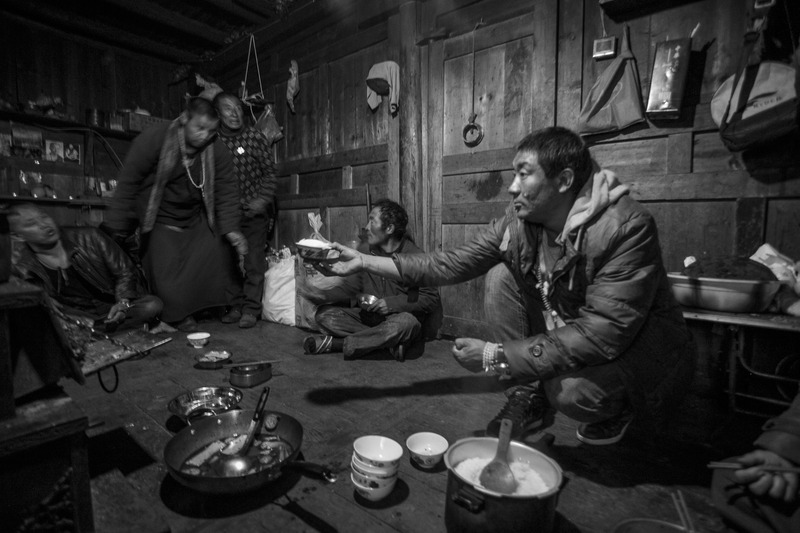 Once, they spent a night over six thousand meters, three people in a tent for two – they swapped every two hours and one of them always had to sit without a sleeping bag. Young wasn’t feeling good so he had to descend back to the monastery. At seven thousand meters, everything slows down. Morning dressing and cooking took them from two to three hours. Their blood circulation slowed down causing a higher risk of frostbite. Another obstacle was the persistent wind, everyday snowing with poor visibility. 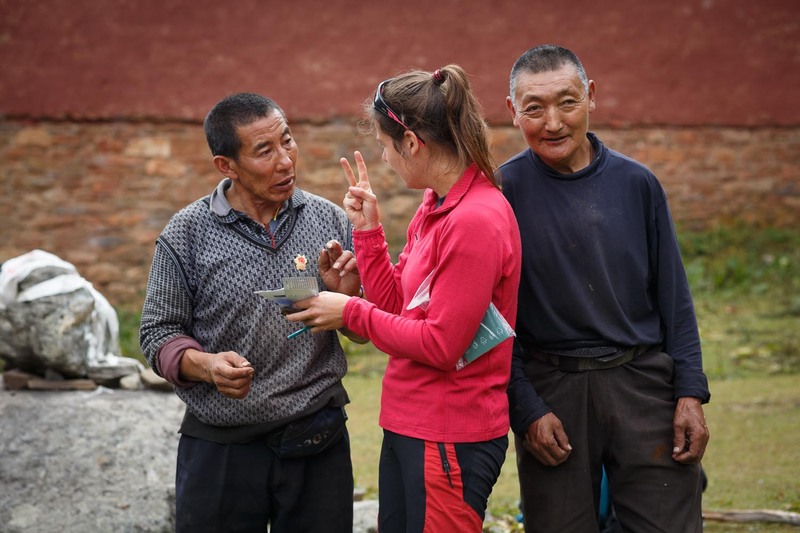 When the weather kept them waiting whole days, they killed time by playing pocket chess: “It was probably the highest league of chess in the world,” said Emmons keeping good mood while describing their play at 7 000 meters. In the second half of October, the weather started to become colder – that brought them clear sky more often and at least some hope. The whole group descended to base camp for some time to rest and gather strength for a last attempt. Winter was coming. They set out. 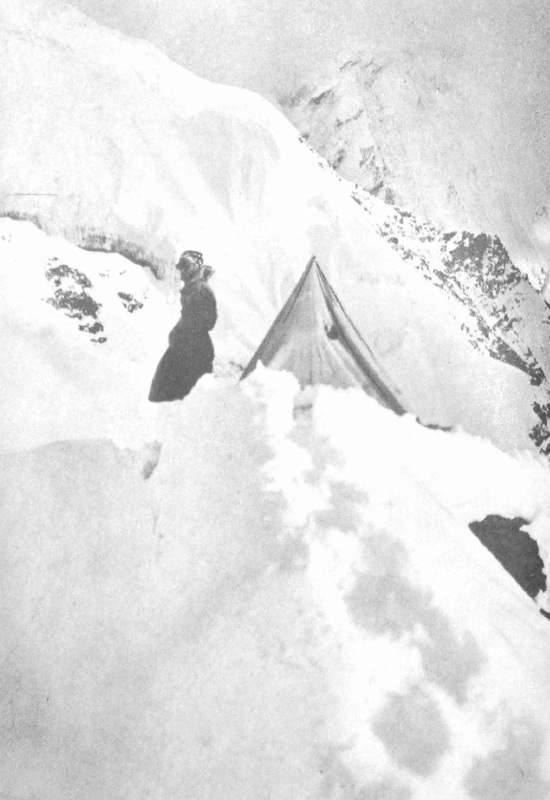 Again, they got to the highest camp and dug out the tent. Emmons and Burdsall already prepared small rucksacks for the morning. Moore was feeling worse, he intended to wait in a sleeping bag. In the end, things changed. When Emmons was trying to halve frozen biscuits, the blade of his knife slipped and cut deep into his fingers – immediately he lost sense and blood perfusion in them. The night before the final ascent, such banal bad luck struck the man who spent the most time on the mountain. After four months of striving, he had to go down. He gave his backpack to Moore and woke up early that morning to help them with a breakfast. He wished them luck and waited. When they returned to the tent, they found out that after a whole day of waiting, Emmons got into the worst condition yet. After few days, he took his boots off and found out that his feet were completely frostbitten. He wanted to descend immediately. He refused to tie in into the rope with his friends – he didn’t want to put them into danger by his furious tempo. 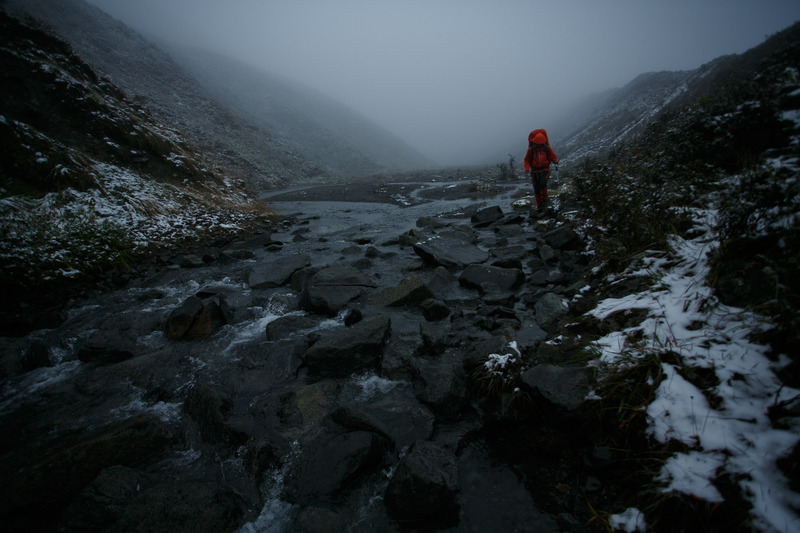 He set out early in the morning, climbed down a ridge unprotected and slid down through unstable snow to base camp. A big avalanche came down right after him. The pain was urging him to speed up. 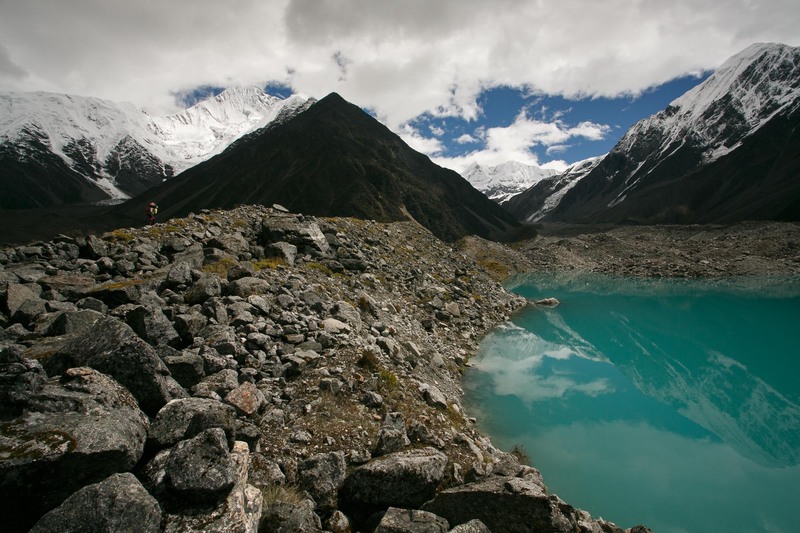 Below the snow level, close to base camp, exhausted and dehydrated, he fell down. 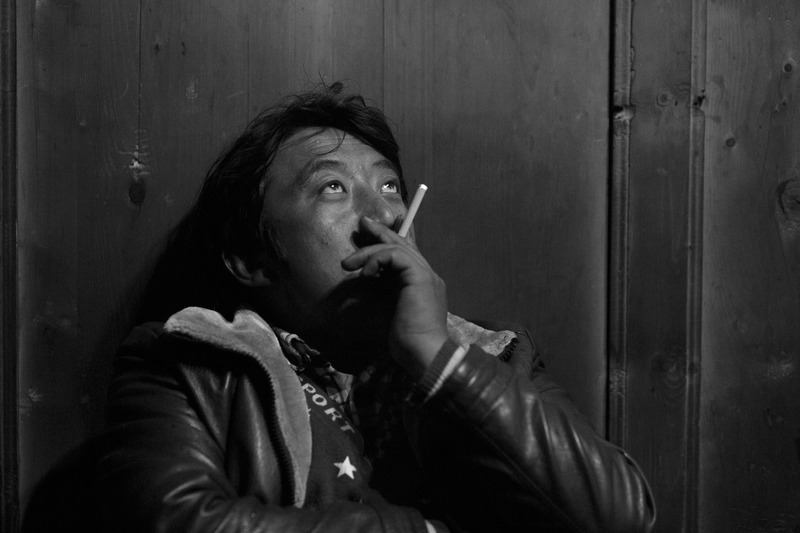 Luckily, Young sent two Tibetans from the monastery to take a look at what was happening up there. They found him and saved him. They brought him back to life (a similar situation happened to Reinhold Messner under Naga Parbat) and swooped in carrying him on their back. Emmons was afraid that infection could get into his feet and thus he tried to reach a doctor as soon as possible. The nearest one was 13 days away. They carried him through “The Valley of Surprises” into the monastery situated in a clearance. Next day, Burdsall arrived as well. In the beginning of November, it has already started snowing on the lower grounds and this whole expedition turned into a white hell. Emmons did not sleep for six nights and spent four days on a pony. “I kept falling off the animal and was feeling sorry for myself at the same time.” Even with the horses, they were not quick enough and they reached the pass at night. Together with Burdsall and Gaom, they had to make an emergency bivouac after 36 hours of travelling without food. They covered with a tiny tarp, which could not prevent the frost from creeping in. In the night, the snow was blowing in from the side. “In my dreams I heard voices. Or weren’t they voices?” remembers Emmons. The impenetrable fog was laying around and the layer of snow on their stiffened bodies was slowly growing. “We heard it again and our hearts jumped. We shouted and heard an answer. Then we saw four vague outlines of bodies coming closer through the falling snow. 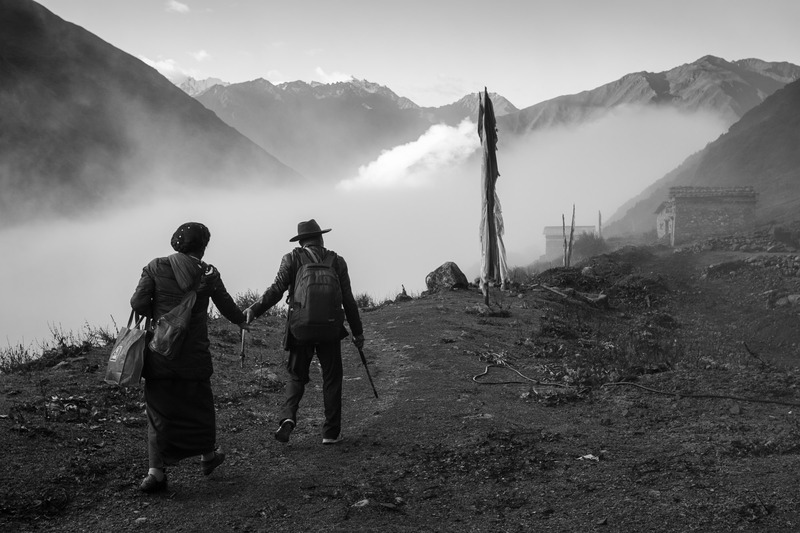 How we loved them!” narrates Emmons the moment they met with four Tibetans who followed them on foot from the monastery and managed to trace them after many hours of walking without any stops. They brought them food. Maybe, if it was not for them, the climbers would not make it through the night. 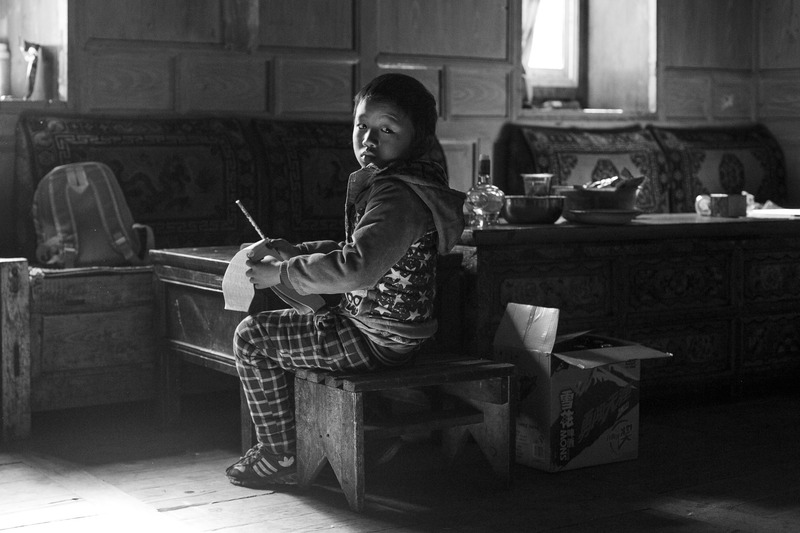 When they returned to civilization, they found out that Sechuan was seized by a civil war. 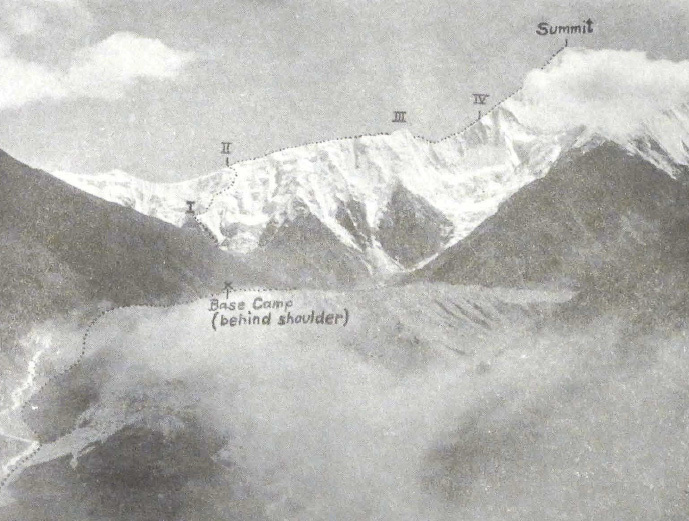 Closed roads everywhere, around 150 000 soldiers ready to fight… They were lucky to reach Kangding where a doctor from an American mission swiftly got to examine Emmons’ frostbite. He suggested moving him to a hospital in Ja-an. 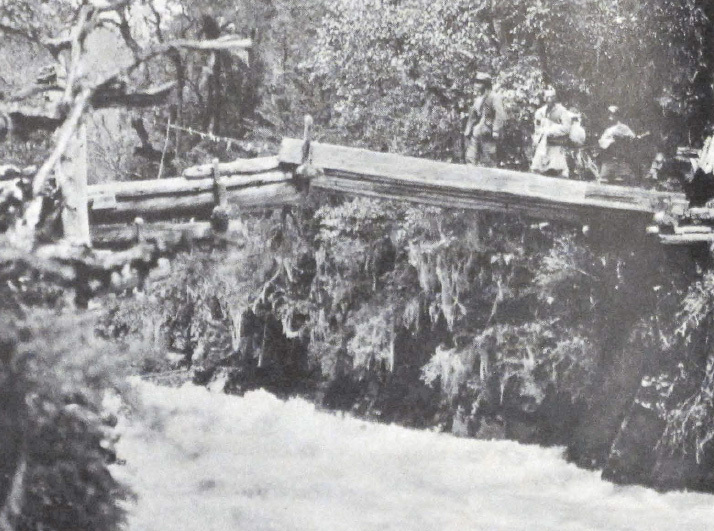 Emmons had to embark on a stretcher for eight more days – two Chinese were carrying him through muddy roads and unstable bridges in moist weather which already increased the risk of infection. Emmons spent next seven months in an American mission hospital. All the members of the expedition happily met at a steamer in New York in December of 1933 at the pier, from which they embarked two years earlier to reach the Minya Konka. “It was one of the greatest adventures a man could imagine. Together we sweated, froze, starved, feasted, and faced hardship and danger. We have discovered the value of teamwork. If there was any time when friendship and trust was put to the test, it was clearly his one. We all have come out of out of this great expedition as lifelong friends,” closes Emmons his book on its last page. and is the highest mountain situated outside of the Himalayan arch. 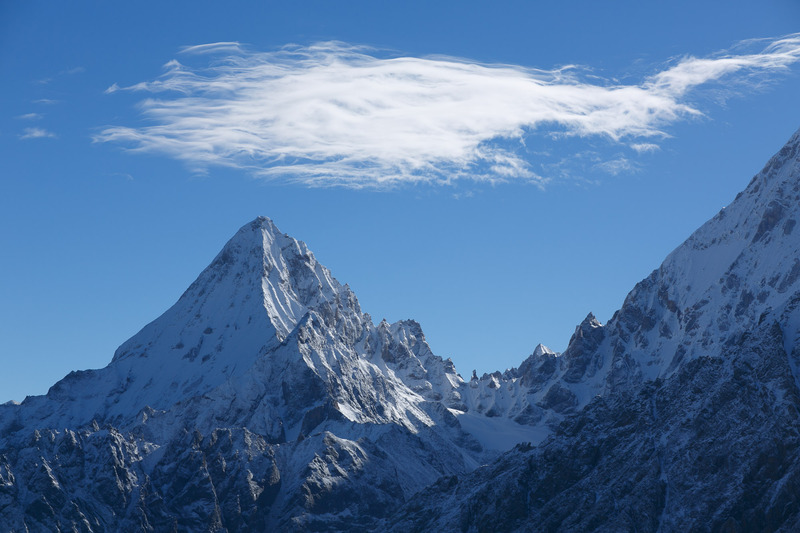 It’s height is 7 556 meters and the main technical difficulties of the ridge are in 50-degree slope. 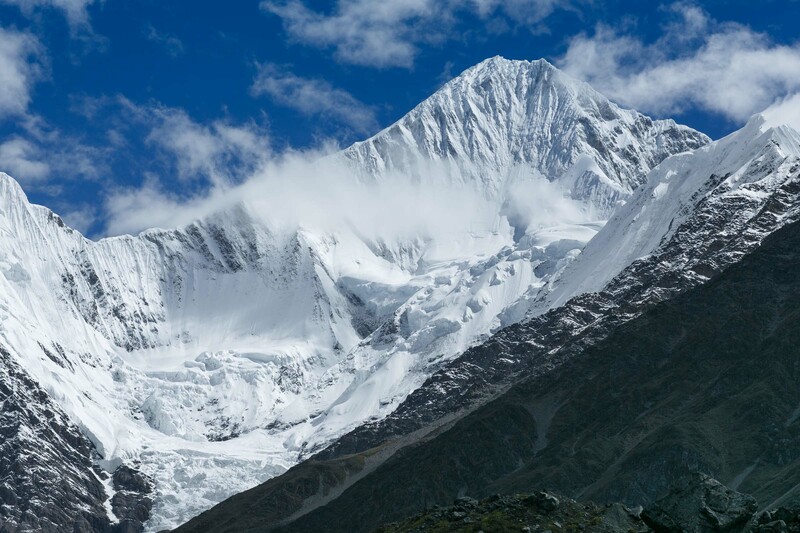 Its name means “White Ice Mountain of Minyang”. 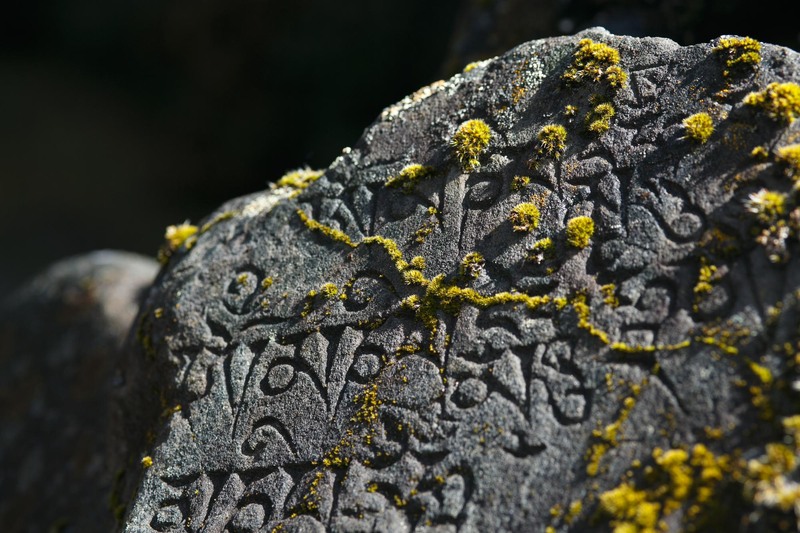 Minyang was a medieval Tibetan kingdom. It is treacherous mostly due to local weather and avalanche danger – the climbing conditions are persistently bad. Most of the expeditions did not even reach the lower part of the ridge. 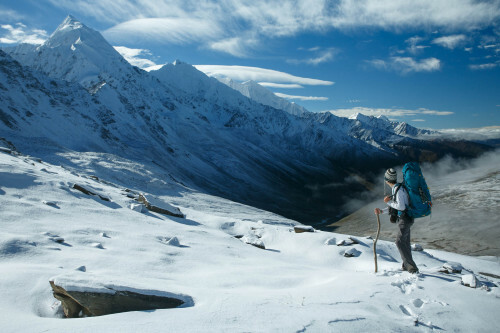 There are only two routes to the summit – both follow the ridge. There were only 20 people who ever climbed it. While 37 mountaineers died there. When you apply the mortality rate equation, you get the nonsense number 185 %*. 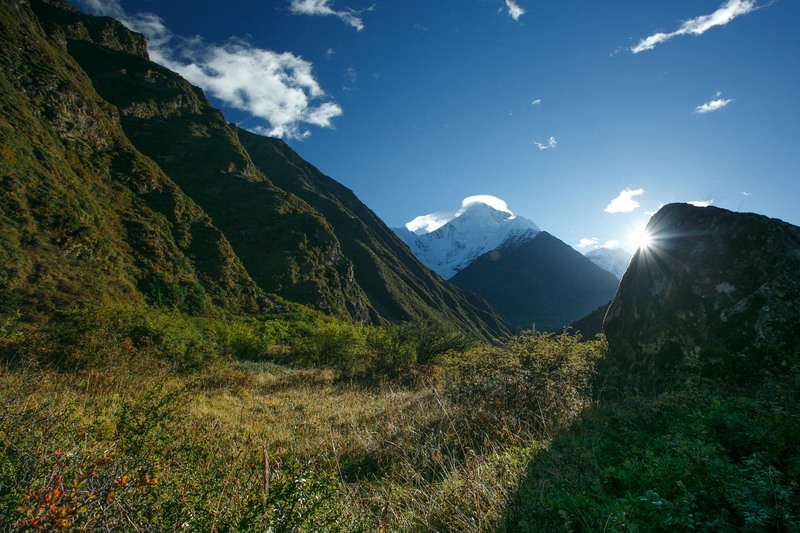 Annapurna It is the toughest of the mountains taller than eight thousand meters – there is a ratio of approximately 200 successful ascents to 38 % of deaths, the second most dangerous one is K2 with 23 % (over 300 successful ascents). 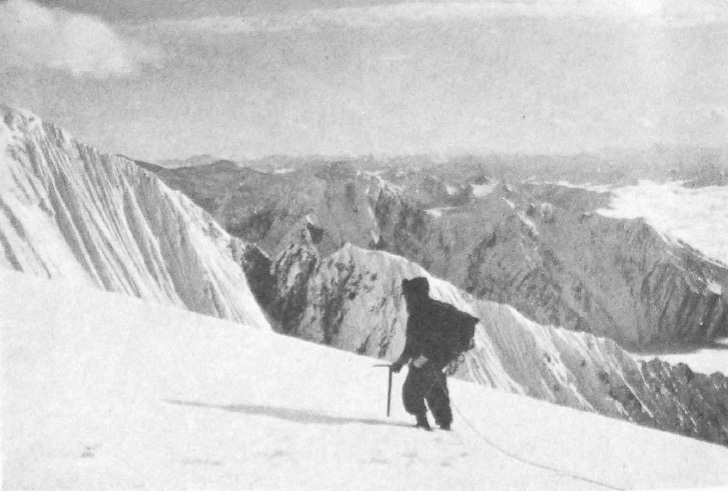 1932 – Two Americans on the summit. First ascent of North-West ridge 28th October. 1957 – Six Chinese on top. North-West ridge. Four dead. 1982 – Three Swiss on the summit. One of them dies during descent. 1982 – After 50 years, another two Americans on the top. North-West ridge. 1984 – Three Germans on the summit. North-West ridge. 1998 – Three Koreans on the summit. 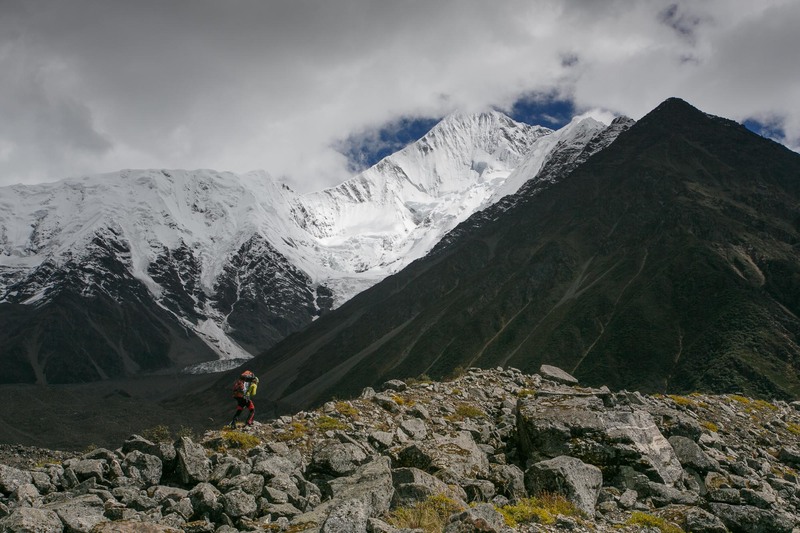 After 50 days, they made a new route to the top – North-East ridge. One dead. 2002 – One Frenchman on the summit. North-West ridge. 2017 – One climber from the Czech Republic on the summit. North-West ridge. Tibetan monastery from the 13th century , which is famous among monks for its holiness. 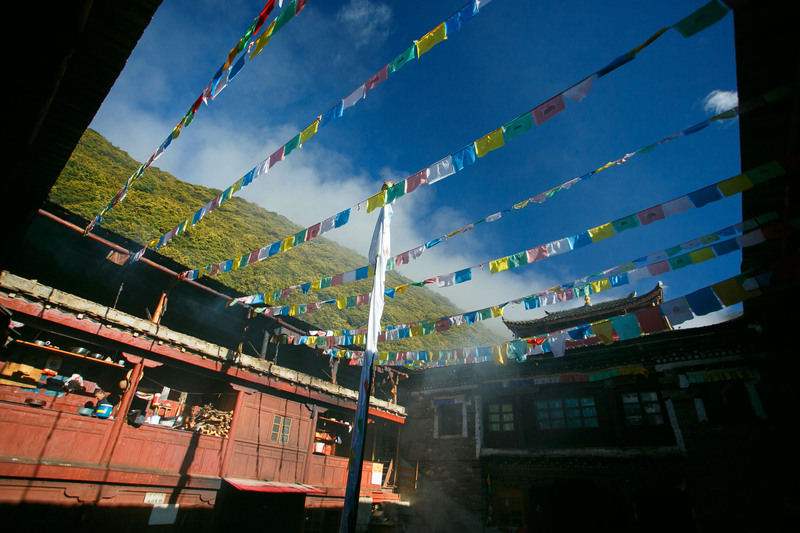 For long years, Buddhists from different parts of Kham and Tibet made pilgrimages there. A stay in Konka temple is said to be equal to ten years of meditations.. It was during the cultural revolution by red Maoist guards. Today, it is rebuilt again, however, the traditional Tibetan roof was replaced by a Chinese ornamented one (in the picture). 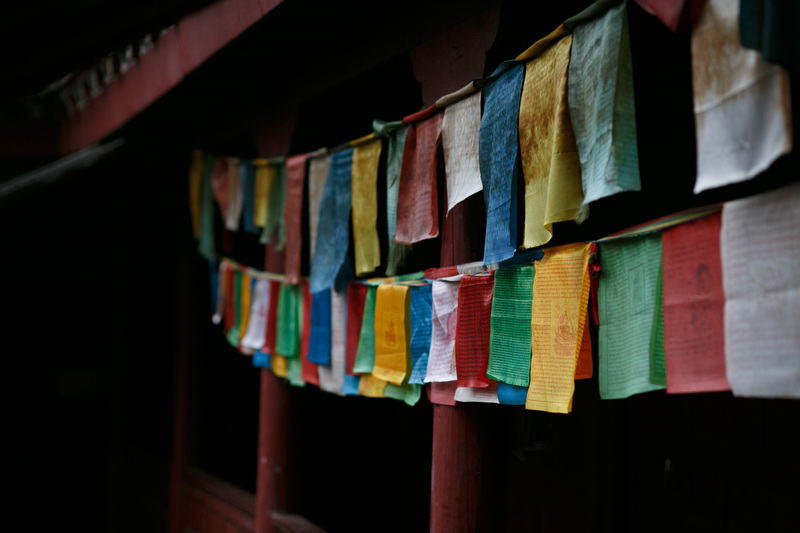 You won’t find the original prayer wheel there now. The monastery is inhabited by eight monks and eight helpers including a government representative. All of them are friendly – especially to foreigners who are not Chinese. You can spend a night there in a monk dormitory with clay walls. Thanks to the solar panel, you can recharge your camera batteries. 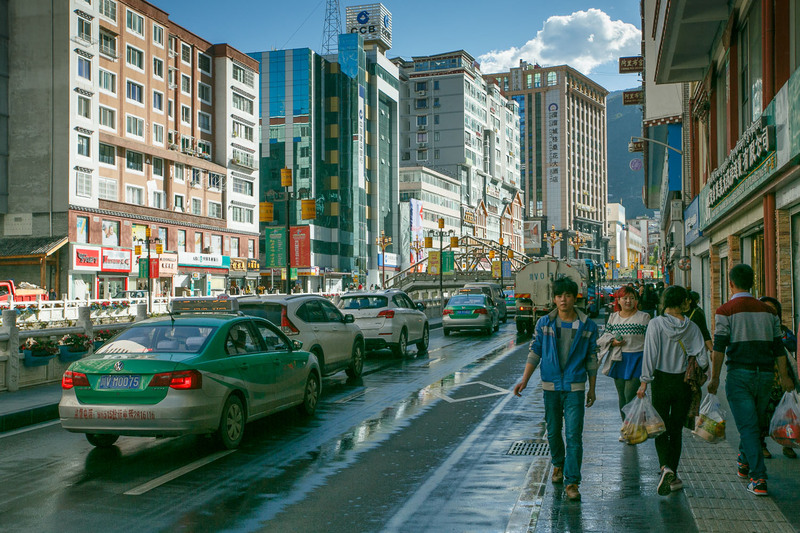 To travel to Sichuan, you will need a Chinese visa. Obtaining it will put your nerves and bank account into test (they want to see at least 4 000 USD on it). Price of Visa varies depending on country you live. 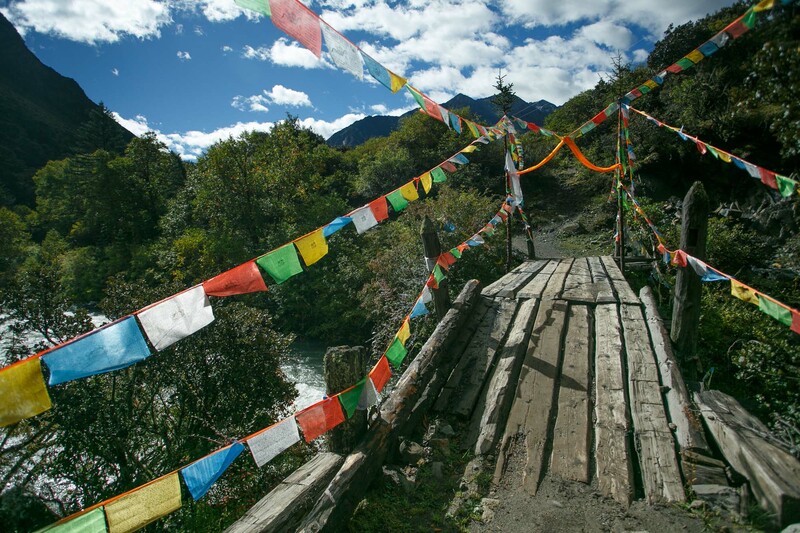 Once you get it, you can travel around the region without any restrictions and without a guide (in contrast to Tibet). 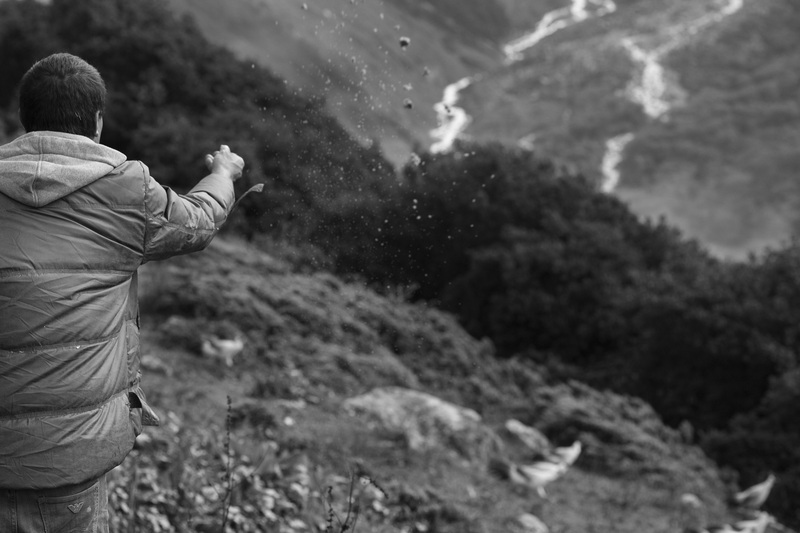 You will use an excessive number of plastic bags and an umbrella – in the mountains (to prevent all your things from getting wet). If you don’t want to be surprised every evening, you will have to bring your own food. The best month for hiking and climbing is according to locals April or the second half of October . The departure point is Chengdu. You can fly there directly from Prague. It also helps a lot if you learn to count in Chinese.